Just like how a great song always has a bit of magic in it, great novels are the combination of an engaging story, excellent prose, and something ethereal, some intangible element that is as powerful as it is unidentifiable. 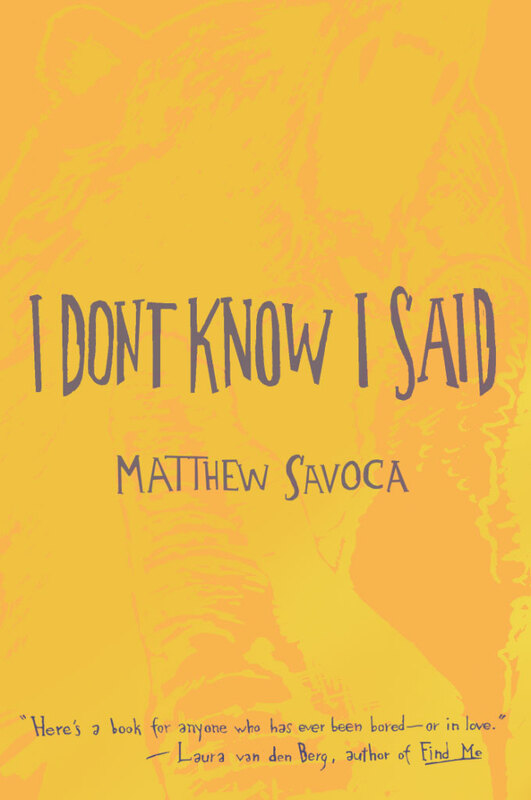 Matthew Savoca’s I Don’t Know I Said is entertaining and well-written, but what makes it a superb narrative is that it seems to have be put together using that mysterious, insubstantial component as glue. Arthur and Carolina are both twenty-something, in love, and have the opportunity to enjoy life without worrying too much about anything. Carolina was involved in a car accident and, while she didn’t suffer any serious injuries, she received enough money to allow them to hit the road and travel around the country for a while. The couple’s aimless, fast-paced wandering leads to many places, both deep and shallow conversations and, for Carolina, to start questioning their purpose and plans for the future. While constantly on the move, the couple is also stationary, mostly just waiting for whatever comes next. Funny, sad, smart, and a bit too real, I Don’t Know I Said dares to ask if having a plan, a focus, or the right answers is worth the hassle. Regardless of your answer, do plan on reading this one.